Apart from the traditional sea salts and seaweed salts, there is also a rise in gourmet blended salts emerging from the different regions in Japan. As home cooks and restaurant chefs get more inventive, so do their condiments. One such example is matcha-shio (green tea salt). Japanese green tea is renowned for its slew of health benefits – from improving concentration levels to boosting energy – so itfs no wonder the Japanese have taken to blending green tea powder with sea salt for a gorgeous combination, matcha-shio. Matcha-shio is something that can be easily prepared in the comfort of your home. Using either matcha powder or sencha and coarse sea salt, blend the two in a spice grinder or mini food processor until you achieve your desired consistency. The result is an exquisite mixture in a subtle green hue; the initial taste has a slight vegetal flavour before giving way to a delicate sweetness. You may use this salt blend to enhance the flavour of everything from edamame to tempura, and even certain vanilla desserts and popcorn! 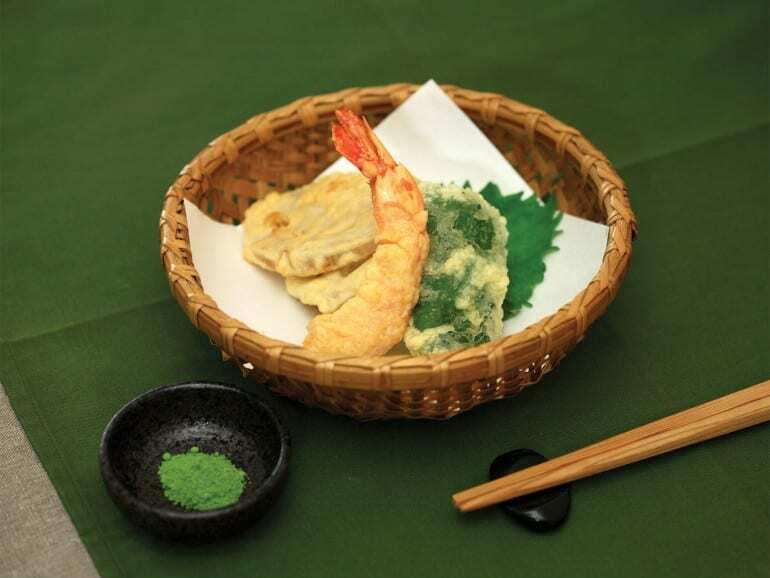 There are several ways to enjoy tempura, such as with a mix of dashi sauce and shio or with matcha-shio. Some people prefer the latter as the tempura is less likely to get soggy. Also, because matcha-shio is so flavourful, you’ll only need a dash of it to enjoy a full-flavoured meal. Another popular type of blended salt is yuzu salt. Yuzu is beloved for its subtle aromas and citrusy flavours. When blended into a salt, the zesty punch of citrus makes yuzu salt an excellent condiment for fish or white meats. It is also sometimes used to add a lift to ramens. Appearance-wise, yuzu salt is a light and pure yellow, and like matcha-shio, itfs so finely ground that it almost looks like powder.